With the help of 35 California and Nevada credit unions, some big financial milestones have been reached in the Credit Union National Association's (CUNA) Consumer Awareness Initiative ("Open Your Eyes to a Credit Union" campaign)—a groundbreaking effort to grow consumer consideration of credit unions as consumers' best financial partners. So far, 430 credit unions and industry partner organizations nationwide have pledged more than $30 million to help fund the campaign over three years. The following credit unions in California and Nevada are participating, with possibly more coming on board in 2019: Alliance CU, Antioch Community FCU, Cal Poly FCU, CU of So Cal, Desert Valleys FCU, Financial Horizons CU, Financial Partners CU, First Entertainment CU, Heritage Community CU, Inland Valley FCU, LBS Financial CU, Partners FCU, Redwood CU, San Mateo CU, SchoolsFirst FCU, SESLOC FCU, South Bay CU, Southland CU, ThinkWise CU, Xceed Financial CU, Ventura County CU, Community First CU, Downey FCU, Foothill FCU, Kaiperm Diablo FCU, Safe CU, Los Angeles Police FCU, Frontwave FCU, Farmers Insurance FCU, Alta Vista CU, Wescom CU, Pacific Service CU, Premier America CU, Altura CU, and LA Financial FCU. Reached more than 4 million consumers. Gained nearly 9 million advertising "impressions." Experienced more than 1.5 million videos watched to completion, meaning consumers paused their online browsing more than 1.5 million times to fully watch an "Open Your Eyes to a Credit Union" campaign video. Credit unions want to grow membership and raise the movement's profile among consumers as the industry reiterates its commitment to raising consumer consideration and bringing on new lifetime credit union members. During CUNA’s 2019 Governmental Affairs Conference (GAC) last week in Washington, D.C., geo-targeted ads were running on mobile devices and featured throughout the Walter E. Washington Convention Center, as well as surrounding areas on shuttle buses, sidewalk clings, in the exhibit hall and hotel keycards. 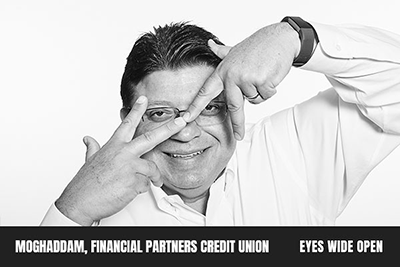 Attendees saw faces of the industry on various signage throughout the week and were encouraged to experience the movement by taking their own "Open Your Eyes to a Credit Union" photos. A panel discussion on the initiative also took place on the GAC mainstage, moderated by Jill Tomalin, COO of CUNA. It featured Mike Brooks, head of strategy at BrandCap; Teresa Freeborn, CEO of Xceed Financial CU; Tara Graff, senior vice president of marketing and business development for Hiway FCU; and Graeme Traynor, managing director for Glover Park Group. The campaign is designed to drive Americans to consider credit unions. Through rigorous advertising testing and continual evaluation of audience engagement in-market, CUNA is refining its strategy to deliver the best campaign results. The integrated approach to media, content and data analytics uses metrics at every point to ensure continuous testing. Visit awareness.creditunion (password: openyoureyes). Review the creative and read the story. Download the message guide at cuna.org/awareness (same web address given above). This is the piece of the awareness initiative that can supercharge your credit union's marketing efforts. It’s a series of recommendations based on our exhaustive research about which credit union messages appeal to consumers. Begin implementing this and your credit union will be poised to take full advantage of this category marketing. Provide feedback about the campaign. CUNA's advisory group is testing everything it learns by partnering with credit unions nationwide on how to optimize the campaign roll-out.